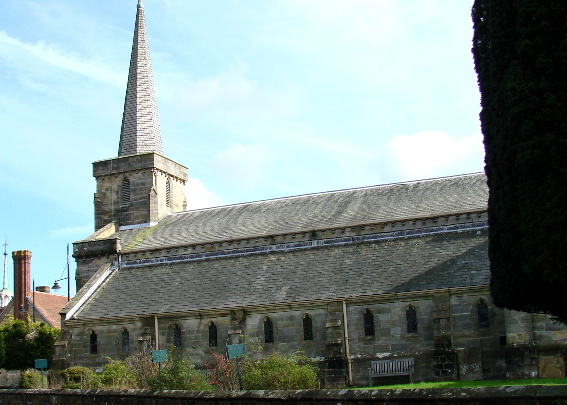 The parish of East Grinstead (now in West Sussex) extended southwards into Ashdown Forest. Forest Row was an early settlement, but only in 1836 was a chapel opened, designed by W Moseley (ICBS). A contemporary engraving (SAS Penfold Bequest no 1043) shows a broad, aisleless nave, with a low-pitched roof and big lancets. The tower has changed little, with a flat parapet and a huge west lancet, filled with bell-louvres, extending almost its entire height above the doorway. 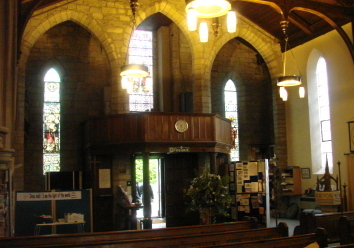 Inside, the tower rests on plain three arches across the west end. 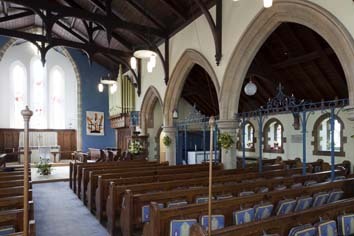 Moseley’s nave roof has three big pendants on each tiebeam. Only the small west gallery remains, though there was certainly a south one, if not on both sides. The east end had probably little more than a recess for a table. In 1850 a district (now a parish) was created and a faculty was granted for 100 new sittings (WSRO Ep/II/27/60). 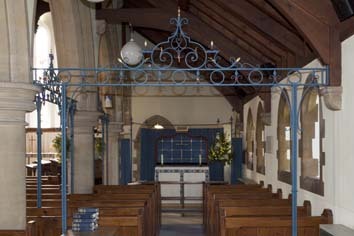 At the same time, J Butler (ICBS) added a short chancel. The detail differs little from that of 1836, including an east triplet. It seems likely that the chancel arch dates from this time, but it differs little from Moseley’s western arches. 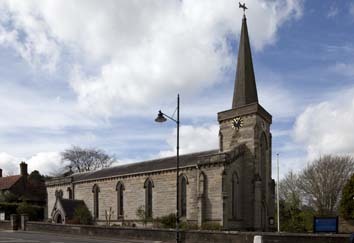 It is not known if the shingled spire on the tower dates from 1850 or 1877, when at a cost of £1715 (KD 1899) H J Green added a south aisle and vestry (B 35 p120), bringing the church to its present size. His work is more accurately C13, though determined by the unaltered low proportions of the nave. The proportions of the trefoiled lancets are correct and the arcade, which does not extend to the west end, has conventional round piers. 2. (Chancel north window, right-hand light) T Willement, c1847 (signed). It cost £12 18s 0d (Willement ledger) and if the date is accurate must have been retained and transferred when Butler added the chancel. Although unsigned and undocumented, all the other glass in the chancel lancets shows many similarities and could well be by the same hand, perhaps dating from when the chancel was extended. 4. (South aisle, first to third windows) A Wilkinson, 1947 and 1953 (DSGW 1958), intended as a war memorial with one centred on the RAF badge. 5. (South aisle, fourth window) St Francis, C Webb, 1960 (DSGW 1961). 6. (South aisle, fifth window) St Dunstan. Maile Studios, 1967 (www.stainedglassrecords.org, retrieved on 22/2/3013). 7. (South aisle, sixth window) T D Randall, c1961 (ibid). 8. (North nave, third window) J Powell and Sons, 1922, designed E Penwarden (Hadley list). 9. (North west nave window) J Powell and Sons, 1913 (ibid). My thanks to Nick Wiseman for all but two of the photographs.